I've broken this lesson section into several pages for faster page loading. Since I get e-mails all the time from art students asking me how I do this or that in a painting, I've decided to dedicate part of this website to painting techniques. 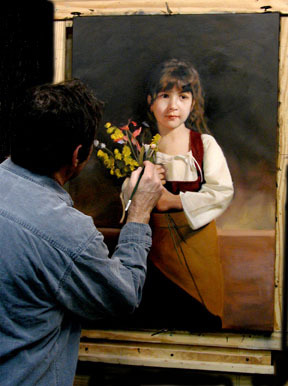 Below you'll find a discussion of realist painting styles, followed by some practical tips and advice on how to get started in realist painting, or if you're already painting, how to accomplish certain things you may want to do in your paintings. Thomas Baker painting "First Bouquet"
Ever since realist painting was declared irrelevant, back around 1900, by the those who set the fashions in the art world, it's been difficult for people who want to learn and master this most ancient and honorable of art forms to get instruction. When the demand for classical art dwindled, and as junk and fad art, not to mention photography, gained in popularity, the number of schools that taught realistic painting shrank drastically, down to nearly none, and to this day not many artists are practicing or teaching classical art. The result is that today, most people who want to learn this art form have few places to go to pick up the skills. This should not discourage anyone who would like to learn to paint in the classical style, however, because most artists are self-taught anyway, even those who receive guidance in an art school, and the lessons of the masters are right there in front of us, for anyone who cares to look. All a student may need is a little help learning how to look. Learning from the examples of the great masters, by studying and copying their paintings, has always been how painting skills were passed down through the ages, as we can see in historical writing. For example, 400 years ago, in his novel Don Quixote, author Cervantes has his hero say: "Let me add that when a painter wants to become famous for his art, he tries to copy originals from the finest artists he knows." (Part I, Chapt. XXV, p. 207, Penguin Classics). That was written in 1604, and it's as true now as it was back then. Right up into the 1800s, if you were an art student and wanted to learn how to paint in a certain style, you went to an art museum, found the paintings that you most admired, bought a permission slip to paint, set up an easel, and copied the paintings right there in the museum. In most art museums of that time you could find student artists painting away in the galleries, carefully copying their favorite paintings to gain insights into how the originals were done. 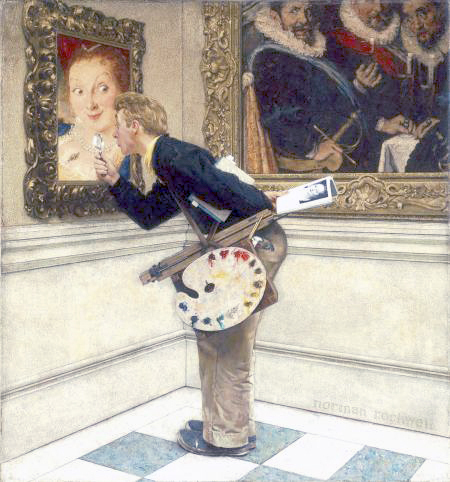 Norman Rockwell implied that it was still possible to do this when he painted his whimsical picture "The Art Critic" (below) in 1955, but the truth is that art museums today are not very happy with artists dripping paint onto their floors from their palettes, as the young man below seems in danger of doing. Today there are still art museums to visit, even if you can't paint in them anymore. What you can do is closely examine and take notes and photos (if allowed) of paintings that interest you, as long as you don't touch them (which can set off loud alarms and cause all sorts of unwelcome excitement). Close visual study and photography of paintings in museums is what I did to create the lessons in the next few pages. Well, you may say, you don't have any art museums within easy reach to visit. But actually you do, since you're reading this online (I presume): you have access at the click of a mouse button to every big art museum in the world on the World Wide Web, not to mention the collections in online galleries, such as the online art museum at the The Art Renewal Center. The work of any famous artist is only a few clicks away in an online image search. In fact, the Google Art Project takes you right inside some of the great art museums of the world, where you can virtually wander about the galleries and magnify any painting you see to an amazing degree--in effect letting you do exactly what the young artist in Rockwell's painting above is doing, without the sore feet. In Google Art Project you can magnify paintings with multiple figures in them to the extent that a single figure's eyeball will fill the entire screen of your computer monitor. That's pretty high magnification, the equivalent of sticking your own eyeball right up to the painting (and probably as good as the view the fellow in Rockwell's painting above is getting through his magnifying glass). Of course, this method has its drawbacks: you're stuck sitting in front of a computer monitor, and the colors you're seeing are subject to the inaccuracies of your monitor's color as well as that of the camera that took the photos (and you can never be sure to what extent the color is off), but all things considered, it's an amazing resource for the art student. In any event, if you're worried about accurate color, you can find the same image of any famous painting in many places on the web, download the best of them, and compare them all until you think you're probably looking at the most accurate representation, or at least the one that you like the best. After online images, your next resort is those big "coffee-table" books of paintings with large color illustrations in them. Of course, those colors are printer's ink, not paint, and the quality of the reproductions varies from excellent to dismal (and again, you never know for sure which it is, without seeing the original painting), but at least from these large color illustrations you can get an idea of the artist's technique, if you can't actually see his brush strokes. Secondhand bookstores are a good place to find these books at a bargain price, since they are often Christmas gifts that are later discarded. New or used, you should amass your own collection of illustrated art books, study them often, and don't forget to check out the art books in your public library. But, always and ever, the best lessons are learned from looking at the real thing. On an actual painting you'll see nuances in the color and brush strokes that just don't show up on computer monitors or book pages. So, get ye to a big-city art museum once in a while. Keep an eye out for those traveling shows of famous paintings that circulate among museums in the larger cities--the arts section of your local newspaper will announce any that are coming to your town. On a business trip or vacation, find the art museums on your route or at your destination. A few hours spent looking at real paintings can yield great insights into painting styles and techniques. Some museums let you use your camera, up close; all of them let you take notes. Eventually, if you haven't already, you'll choose some favorite artists whose style you would like to imitate, at least until you gain enough painting experience to branch off and establish your own style. On the next page we'll examine the styles of some famous realist oil painters.